Last month Sakae Sushi has launch a new revamp menu which includes the S$3.99 pink plate, appetising new dishes and desserts to pamper their loyal customer. And finally today, I am able to try this Maguro(Tuna) Tataki Salad which is also a new dish that is often SOLD OUT during a few of my visits. This is my first try on eating Tuna that is lightly grilled and served with a very matching Salad dressing that brings out the wonderful flavour of this fresh tuna. On whole this dish is served together with some deep-fried Kakiage which is a type of tempura made with mixed vegetable strips and half of a soft-boiled egg topped with ikura. All these cost S$9.99 per serving, so wait no more try it out at any of the Sakae outlets near your area. The chef at Sembawang branch cooks a better Garlic Rice than the one I had in another branch in town. The taste of the rice blends well with the seasoning and it taste great with that extra Krill topping. Mum and I loves this "Ajitsuke Idako" which is a kind of seasoned baby octopus that is served as a cold dish. The seasoning and the texture of the octopus make it a great combination appetiser. Sometime we can even get 2 or 3 plates at a go. Mentaiko Tofu is also another new dish on the list and for your information "Mentaiko is actually the marinated roe of pollock". But overall we find this dish too oily and the fried tofu is kind of soggy which made this dish a bit of greasy. Dual combination or fish roes for this Lobster Salad Combo which cost S$3.99. I am sure this sure worth the price for this dish where you can have both Lobster and generous amount of fish roes as topping. Today's dessert I would like to try their "Imo Caramel - Japanese Caramelized Sweet Potatoes" which resemble one of the Taiwan after meal dessert we had during our recent Taiwan trip in April. But the different between the two is, Sakae Imo Caramel is in strips form whereas Taiwan's is in cube form and before eating we have to dip the Imo Cubes in cold water so that the caramel will not stick together. Although the Imo Caramel at Sakae taste good but it's kind of hard to bite, maybe the kitchen staff has over-fried it :p Hope the next round when I order this dessert the caramelized sweet potato won't taste hard and dry. I was toggling on whether to order the Goma or Matcha Ice-cream for our 2nd dessert. Since I have already tried their Matcha Ice Cream with Warabi Mochi which taste absolutely great, I decided to give their Goma Ice-cream a go too. The texture is great with a mild black sesame taste and you can even get some bites of whole sesame in it. But it depend whether will you spend S$2.99 for a worth trying single scoop of ice-cream! 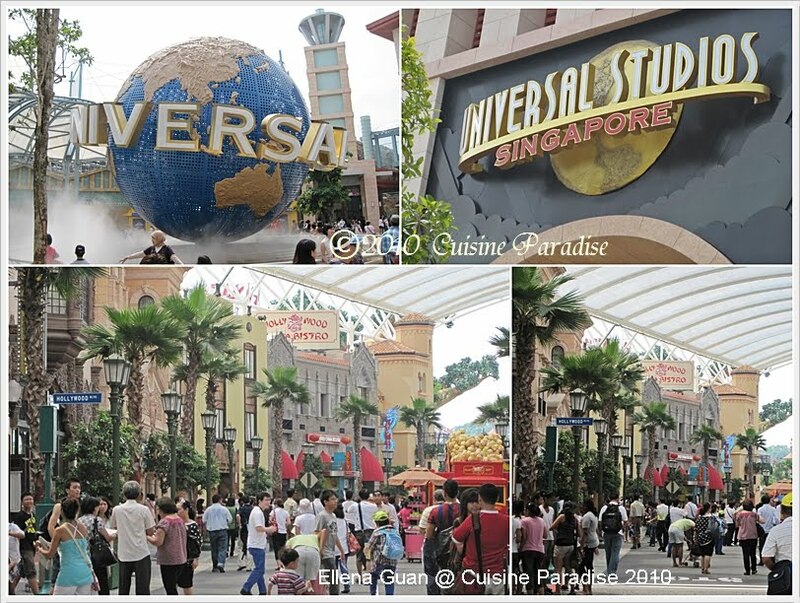 Em... ever since Universal Studios, Singapore open to public access on 18 March 2010, it has being my thought to bring Rey to take a look at the newly renovated Waterfront Station and Theme Park in Sentosa. 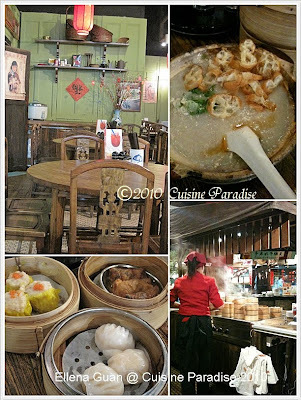 Today is an sunny Saturday morning, we decided to have a some light Dim Sum breakfast at Xin Fu Yin Cha - 幸福饮茶 stall that is located at Food Republic in Vivo City Lvl 3. The furnishing in the stall was in wooden-style chairs and tables which make it look like those 60s -70s stall. Although it's about 10.00am in the morning, there is a lot of people queuing up to grab their favourite dim sum. 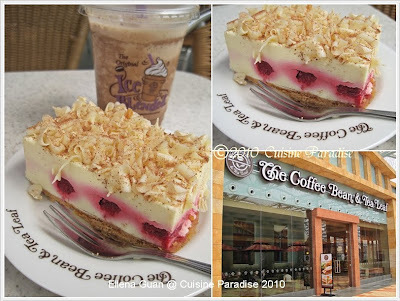 Overall, we are still very satisfy with their ingredients but the price over here it's rather the same as those in it's main restaurant. 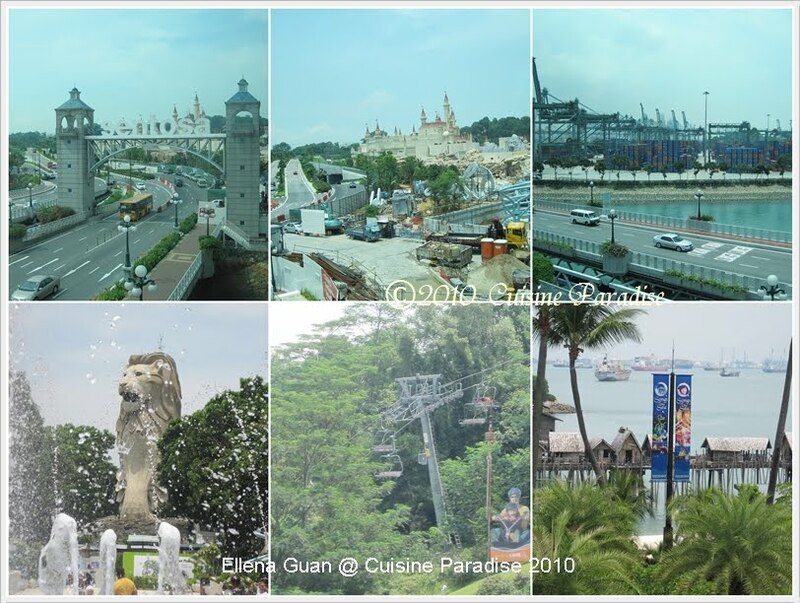 From Vivo City, we took the Sentosa Express near the ticketing station outside Food Republic at level 3. 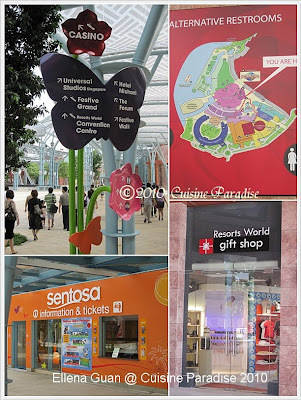 The Sentosa Pass is available at S$3.00 per person per day at the Sentosa Express station. You can also enter the island via Sentosa Express using your ez-link card which shorten your time of queuing up during weekend crowds. At about less than 10 minutes train ride, we reached Waterfront Station. We were so shock with it's new outlook and changes compare to the previous musical fountain, orchid garden, fish pond and etc that this place used to have. I am sure everyone will not lost their way because there are a lot of interesting signboards and direction sign. 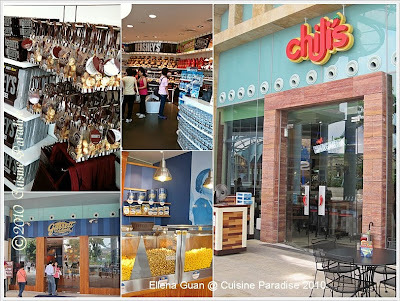 About 100m away from the Waterfront Station, you will reach "The Bull Ring" where you will find some Gifts and Collectibles retail stores as well as "Chili's Grill & Bar" at the corner. 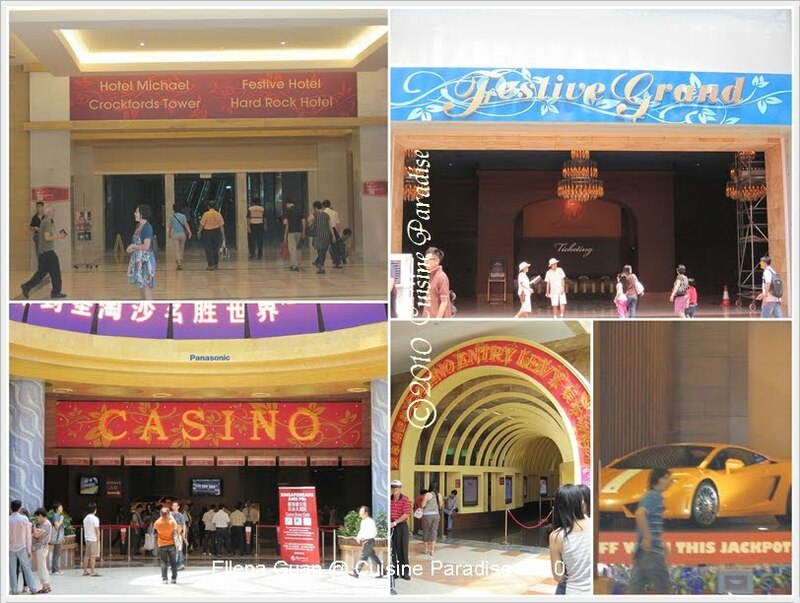 2nd big attraction of Resort World will be it's Casino that is located at the ground level of "The Forum". After taking the escalator beside "Lake of Dreams", we finally saw the Grand entrance of the Casino. All Singapore Citizens or Permanent Residents must have a valid Casino Entry Levy (S$100.00 for 24 hrs) to enter the casino. And you will be surprised to see that beautiful "Lamborghin" outside the Casino entrance that will be given out to the Jackpot winner. Look at the photo of the fountain on the left, that is the "Lake of Dreams" which is a unique musical extravaganza where fire, water and light are the stars of the show. Further down on the stretch, you will come across "Festive Terrace" which is surround by Hotel Michael and Crockfords Tower. 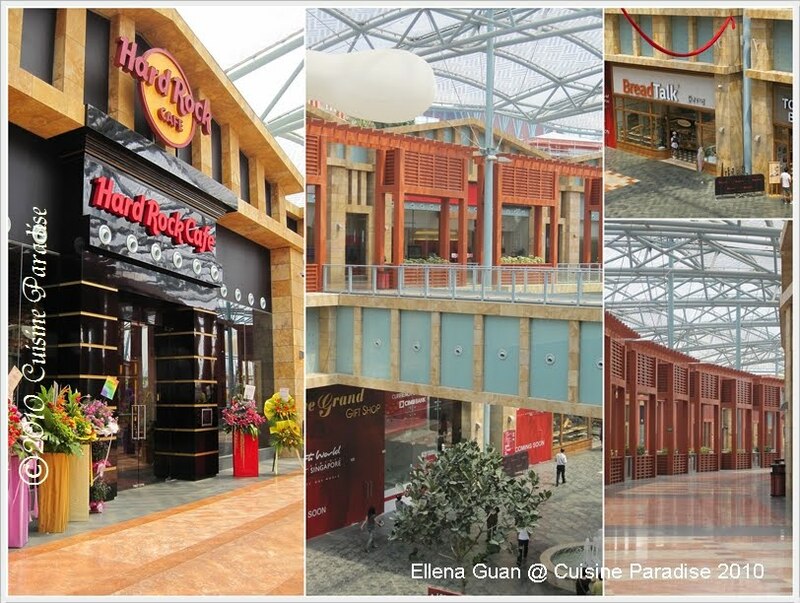 Inside Crockfords Tower, they are range of branded shops in Galleria walk. P/s: For more photos of the trip check us out @ Cuisine Paradise Fan Page, click HERE. After a good night rest upon arriving at Tao Yuan(桃园), some where outskirt of old Taipei. 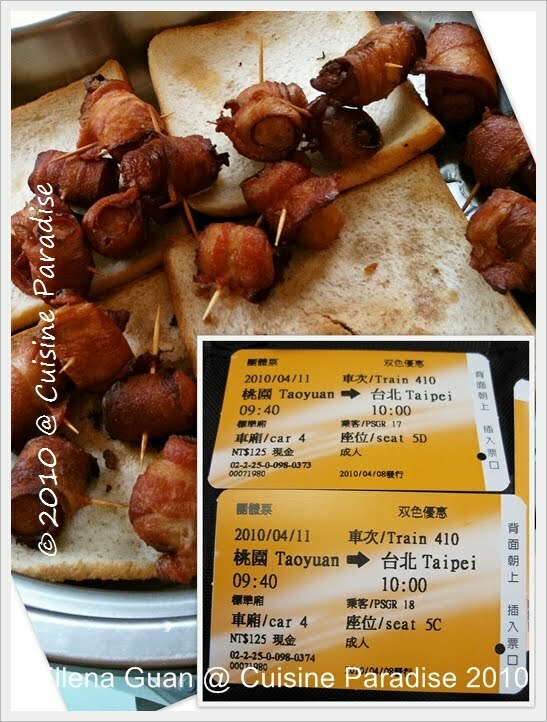 We are advice by the tour leader to wake up, get ready and have our morning breakfast around 7.15pm before proceeding to the HSR (Taiwan High Speed Rail - 台灣高速鐵路) station at Tao Yuan. According to the Jackson(our Taiwan tour guide) if we were to travel by coach from Tao Yuan to Taipei it will takes about 45 minutes to an hour ride. But if we travel by HSR from Tao Yuan station, the journey will be shorten to about 15 minutes or so. It has being more than 10 years since my last ride of this type of bullet train during my school time in Europe. 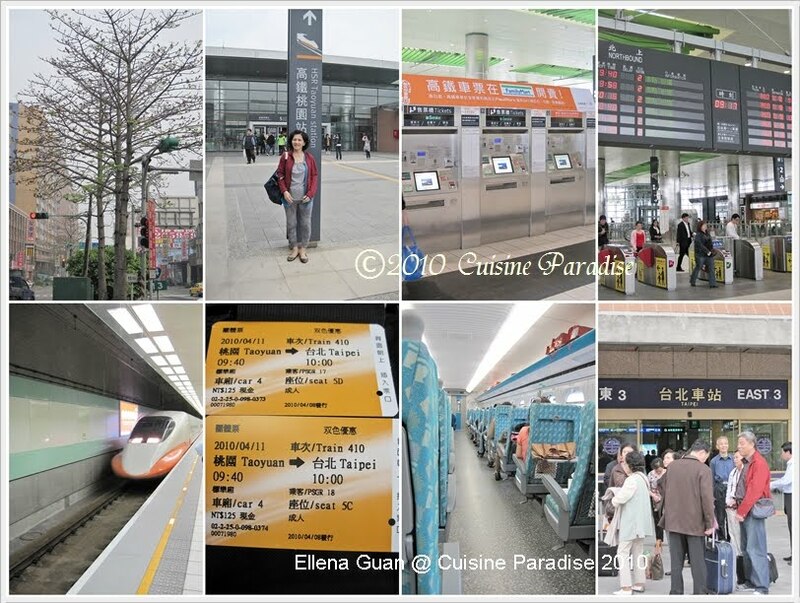 The Taiwan HSR station is very bright and clean and each ticket is label clearly with the cabin number so that it won't be over crowded in each cabin. From Taipei HSR station, our coach is there waiting to pick us up to Yeliu - 野柳 where they have this beautiful Yeliu Geopark (野柳地质公园) which is about 1.5 hours away from Taipei. 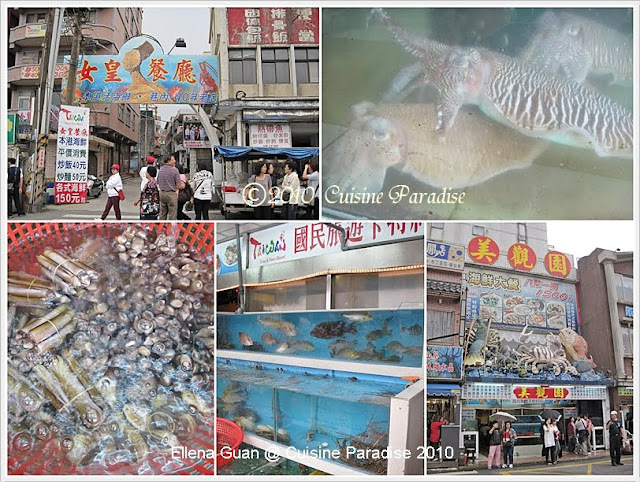 Before heading to the Geopark, we have our seafood lunch at Mei Guan Yuan - 美观圆海鲜餐厅. Look at those tanks of fresh seafood and the beautiful sea creature design outside the restaurant. 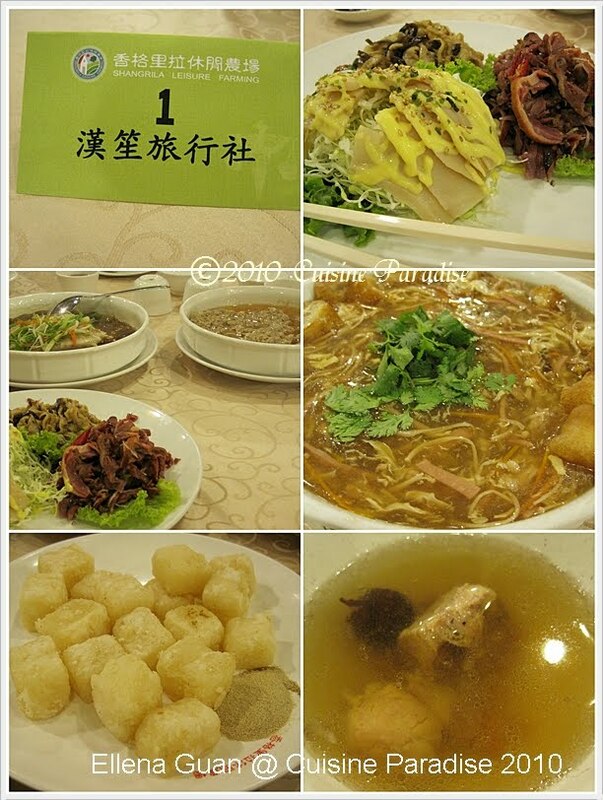 These are some of our lunch dishes served at Mei Guan Yuan - 美观圆海鲜餐厅. 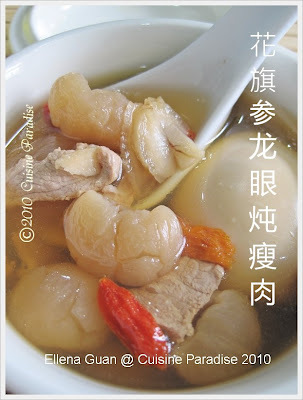 I find the stir-fry Tofu with oyster dish very appetising and I am interested in replicate it when I am free. The seafood served at this restaurant are very fresh and sweet compare to most of the stalls we had in Singapore. 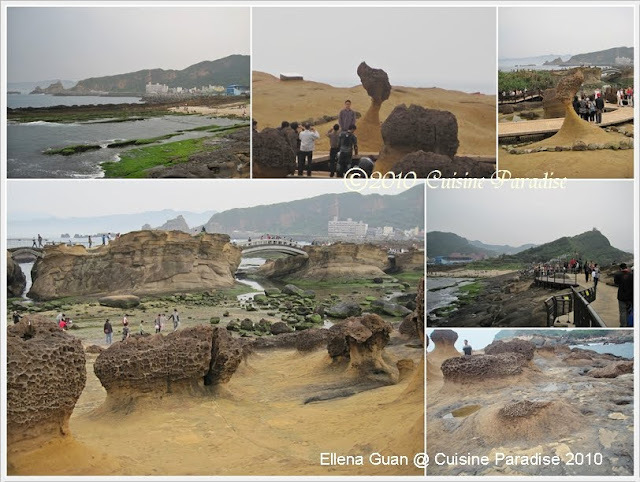 After a good lunch, the tour guide lead us to the opposite side of the road where we begin to start our exploring journey in this beautiful Yeliu Geopark (野柳地质公园) where you can find a lot of interesting rock formations which have been given imaginative names based on their shapes. 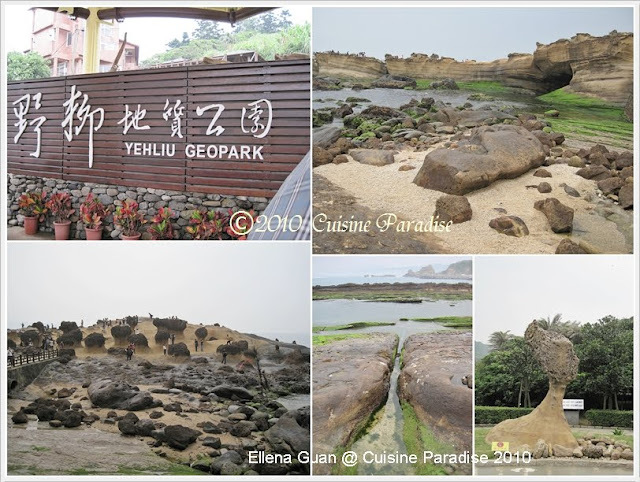 The most well-known is the "The Queen's Head" (女王頭), an iconic image in Taiwan. Although the weather is cloudy with drizzling rain, there are still crowds of tourists gathering around taking photos of the rocks. Rey was totally excited about this place and he took a lot of photos of these rocks. After admiring at those special rocks, it is time for some snacks again.... 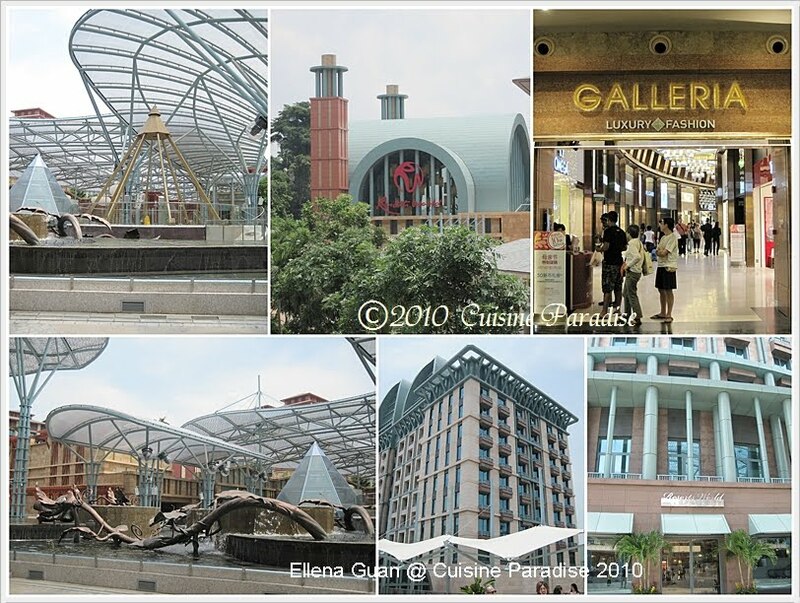 Here we walk along the "Gift Of Yeliu - 野柳特产街" just beside the exit. 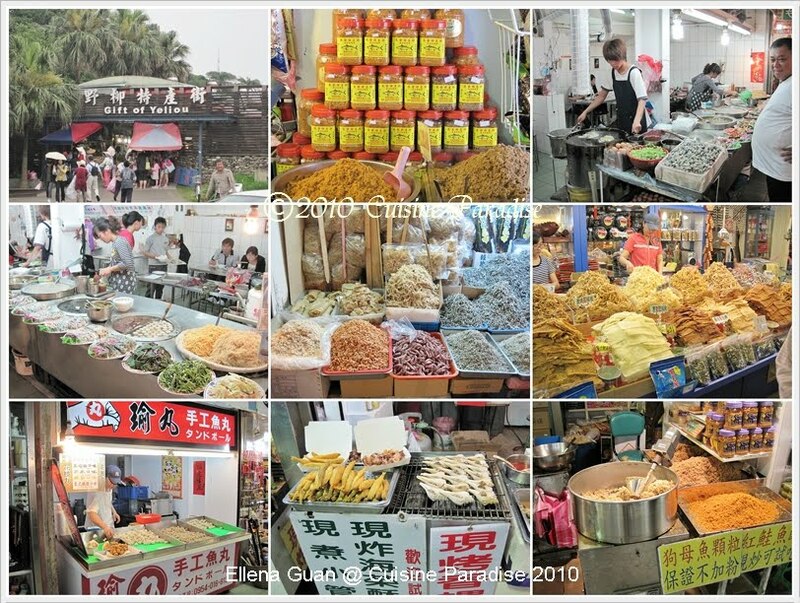 You can get all kinds of dried products here range from shrimp, ikan bilis, cod fish and etc. 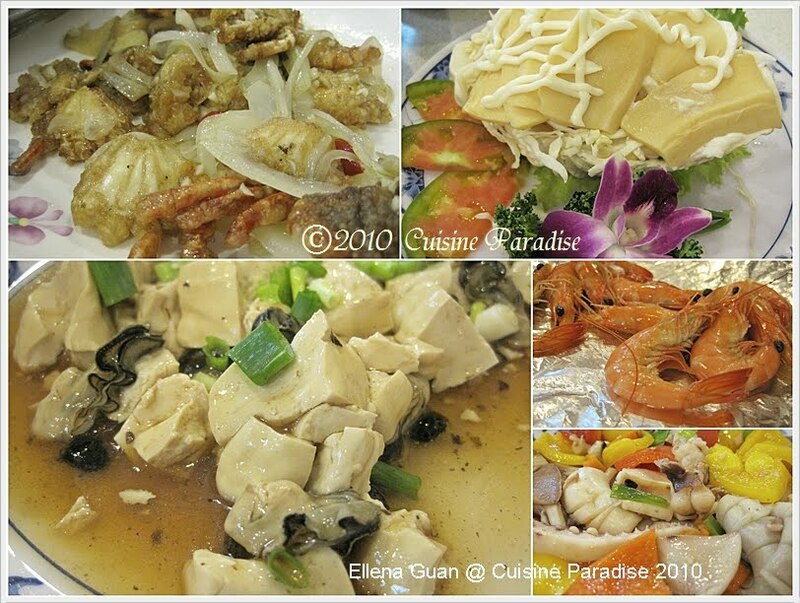 Or if you are hungry, you can grab a bite with some local BBQ seafood or their famous fried oyster cake or rice noodles. Yeliu is famous for their salmon fish floss too.... Grace aunty even ask us to get some of their salmon floss for her because she find it very nice during her previous visit to Yeliu. Due to the narrow street and heavy traffic at Jiufen during weekends, we have to take their public bus transport at the foot of the mountain to go to their market street where they sell all kinds of their signature foods. 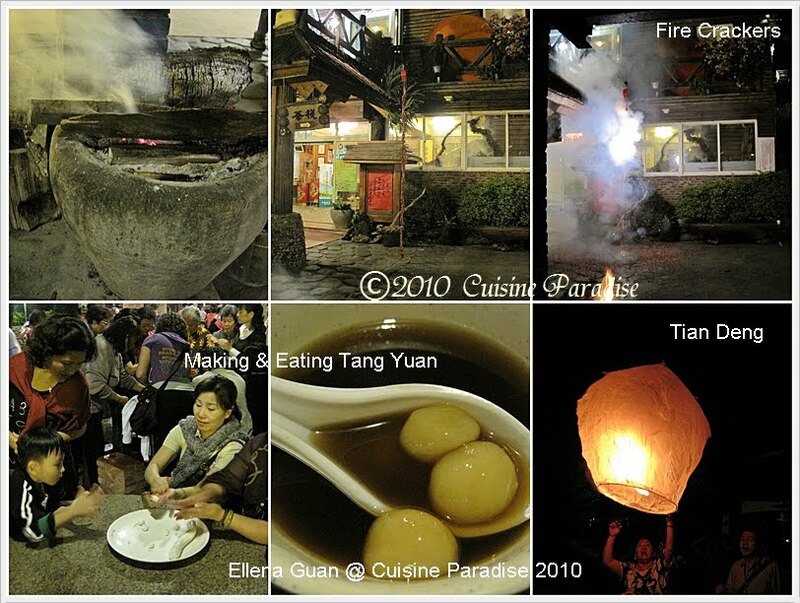 Look at the photos on 2nd row, that is their famous Jiufen Yuyuan - 九份芋圆 which we ate two bowl in a row... The bowl of dessert consist of a mixture of yam, sweet potato and purple huai shan dumpling together with red bean, green bean, lotus seeds, and etc serving in their special sweet soup. 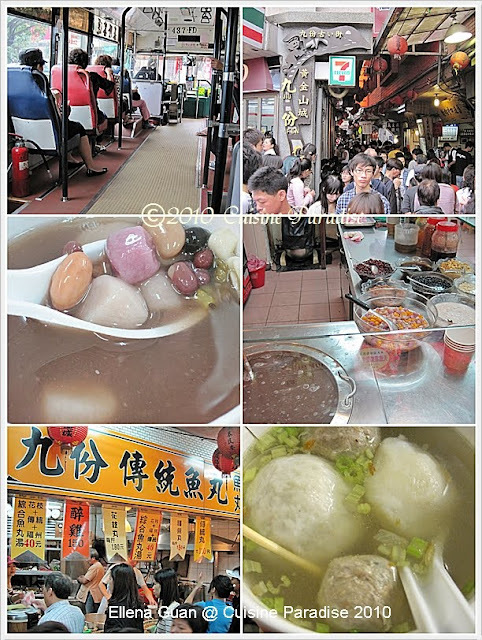 Other than dumplings, there is another famous Handmade Fishball soup near the entrance of the food street. 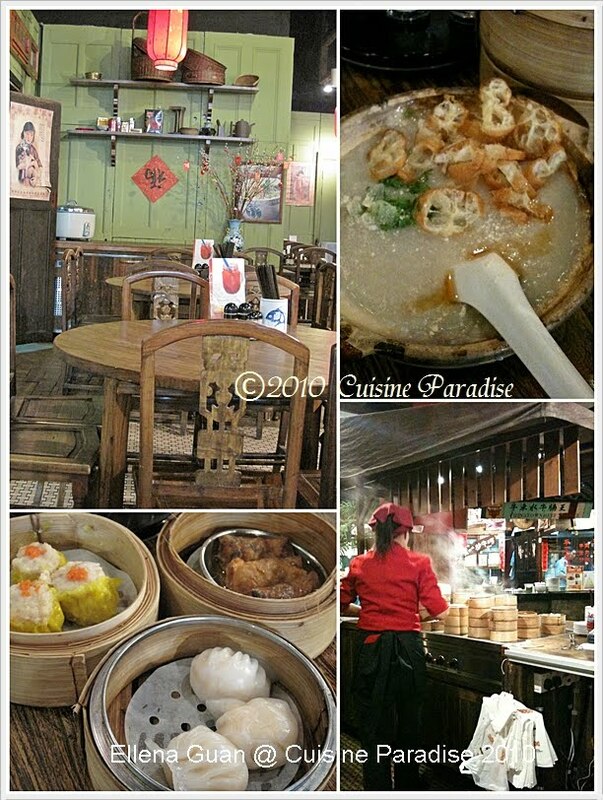 The soup is sweet, light and fragrant to taste and their fishball is so Q, juicy and tender. Further down the stretch, you can find all kinds of food stall from ice-cream pancake, steam honey comb cupcake, candied fruits, BBQ King Oyster Mushroom, Sesame Mochi, Hong Zao(红槽) meat dumpling and etc. After Jiufen we travel for about another 1 hour or so to reach Yilan - 宜兰 at about 6.00pm. 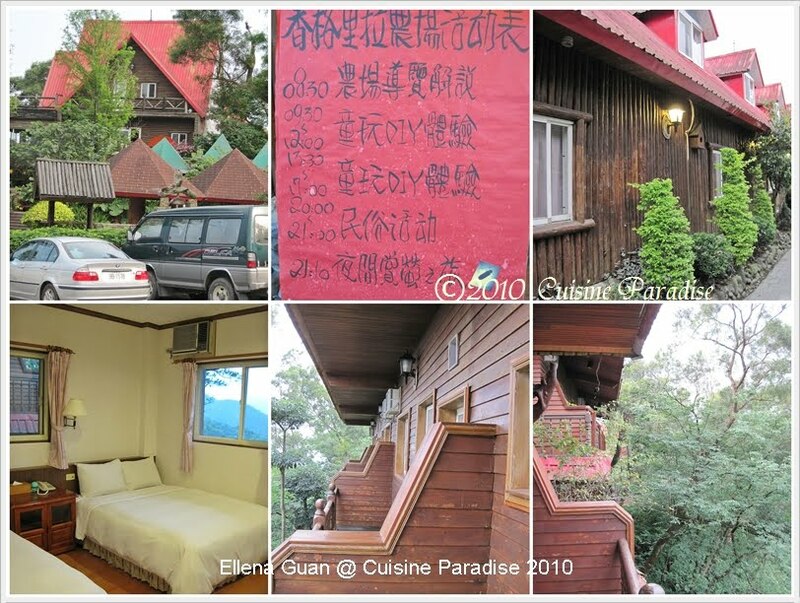 According to the itinerary , we are staying at "Shangrila Leisure Farming - 香格里拉休閒農場" where we can experience European style romantic vacation villa located in the forest. All the buildings there are made by whole log, and the atmosphere is very country-style living. As we reach there pretty late in the evening, we are unable to go to their fruit garden where we can experience plucking all kinds fresh fruits from the tree. After dinner, almost all the guests will be gathering at the performance square where everyone can participate in a series of creative activities such as: making your very own "Dumplings - 汤圆" with hands, the match of spinning tops and also writing and putting "Tian Deng -天灯" for praying and blessings etc. After putting off the Tian Deng, we also join in their special event "Fireflies Tour - 营火虫之旅" where we follower the person-in-charge to a 15 - 20 minutes night walk in the forest without any light accessible. As the person mention that fireflies are afraid of strong light which will hurt them, so we are all not allow to bring torch or take photos with flash light mode. Overall this is a very fruitful farm-stay experience where Rey gets to experience another kind of living standard in the country side which is so much different from what we have in Singapore. He really enjoys the activities there especially, the Fireflies Tour. Recently mum has being complaining that she is feeling fatigue and body aching due to the weather and amount of household chore she is coping as well as taking care of her precious grandson. 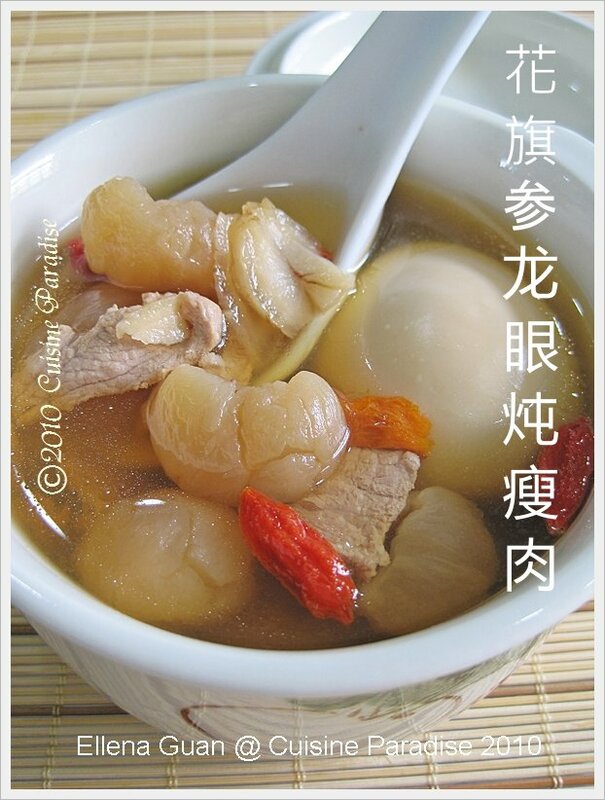 So in order to reward her, I decided to make a bowl of this Ginseng Soup for her. This is a very good and reviving soup for adult or even youngsters whom always stay up late for studies. American Ginseng or known as 花旗參/西洋参 is sweet in taste, with a hint of bitterness and cool in nature. It nourishes the Yin energy in the lungs, clears Asthenic Fire, benefit the Stomach and promotes secretion of body fluid. It mainly treats Dryness of Lungs and Stomach and dire thirst and Qi, therefore strengthens the internal organs. Dried Longan taste sweet and of neutral nature where it nourishes the heart and the spleen, benefits bloods and calms the spirit. It works well for treating tensions, palpitation, insomnia and forgetfulness. 1. 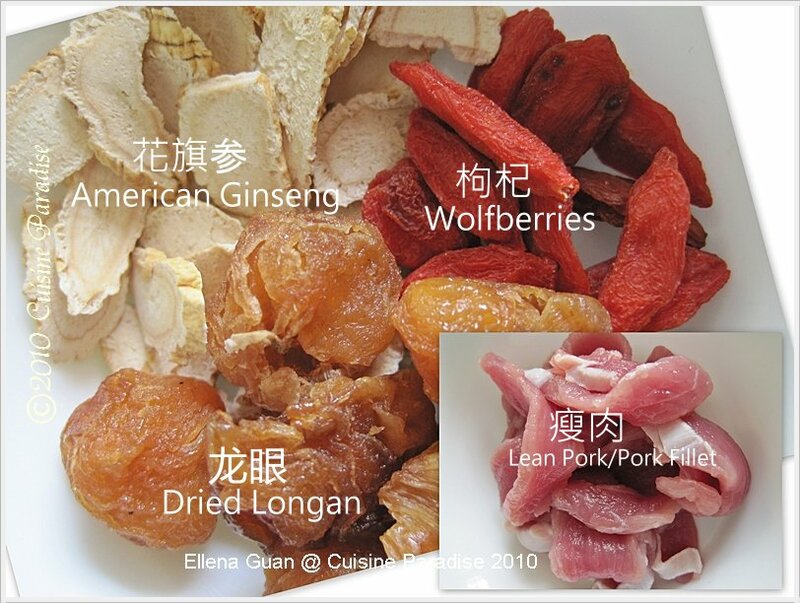 Rinse the American Ginseng slices and Dried Longan in hot water then drain off. 2. Blanched the pork fillet in boiled water for 30 seconds, removed, rinse and set aside. 2. Put all the ingredients except wolfberries in a small double-boiler pot in a slow-cooker and double-boiled for about 2 hours on low heat. 3. Add in wolfberries at the last 15 minutes, cover and continue to cook before serving it warm 30 minutes to an hour before bedtime. Notes: When taking this drink it is best that you don't eat any dish or soup that contain raddish or beans for 1 - 2 days, because Chinese believed that raddish will drain and absorb all the good source from the Ginseng. The purpose of adding pork fillet is to sweeten and enhance the taste of this soup. If you want it to be a vegetarian soup, omit pork and egg or you can replace pork with chicken if you prefer poultry. During my recent trip to Taiwan, almost every morning we can find some freshly made Mantou in our breakfast menu. 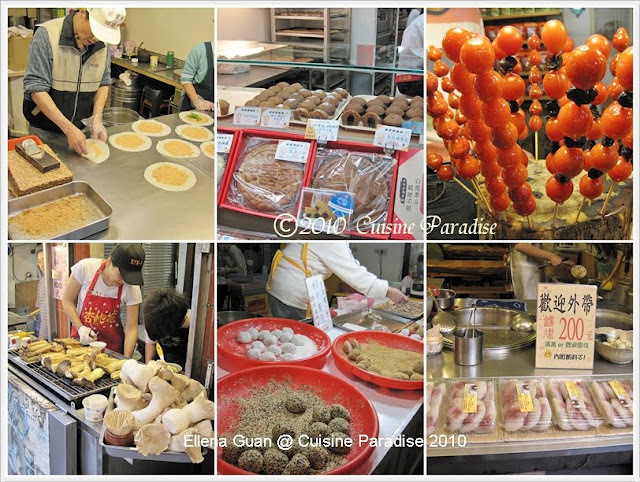 In Taiwan, most of their breakfast dishes are Mantou, Porridge with preserved vegetables like caixin, bamboo shoot, salted egg and etc. 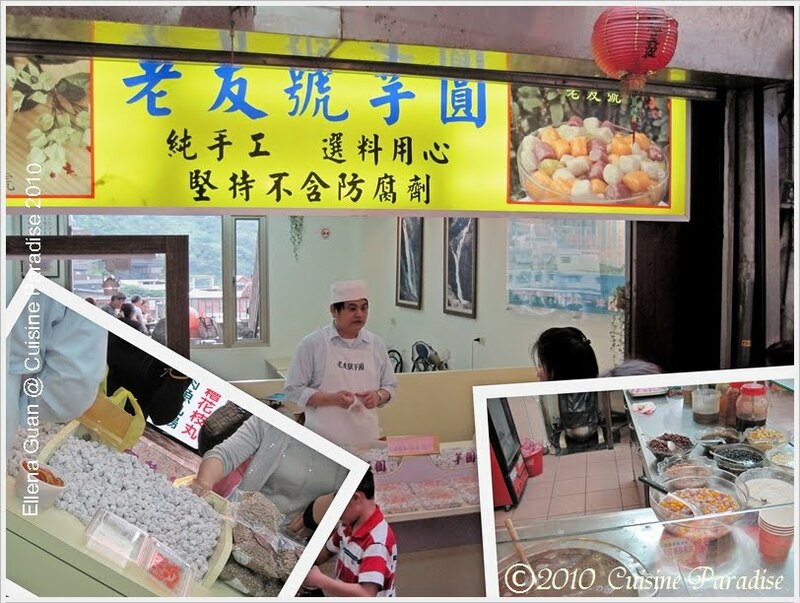 And other than Mantou, you can also find their famous Baked Golden Sweet Potato in some shops or street market. So for last weekend, I decided to combine some orange flesh sweet potato with the Japanese sweet potato that can be easily found in any supermarket. This Mantou will give you two different textures, as I have shredded the orange flesh sweet potato as filling and combined the mashed Japanese Sweet Potato together with the flour ingredients. 1. Sift the plain flour and baking powder together in a big bowl together with the caster sugar till combined. 3. Use a fork or food masher to mash the sweet potato cubes to form a paste, set aside for later use. 4. Add the dry yeast into the lukewarm water and give it a quick stir then set aside for about 5 minutes till bubbles appeared(refer to the picture above). 5. Next slowly stir in the yeast water into the flour mixture and using a pair of chopstick then follow by the mashed pumpkin till it form a soft dough. 6. Rub some oil on your hand then give the dough a quick knead till well combine. 7. Set the dough aside in a lightly flour/oil bowl and let it proof for about 20 - 30 minutes so that the dough will raise slightly bigger. 8. 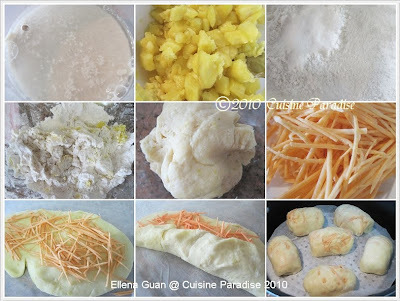 Knead proof dough on a lightly floured work surface for a few second, flatten and roll into a rectangular shape shown in the above photo, sprinkle some shredded orange flesh sweet potato on it, roll it up lengthwise into an oblong shape. 9. Repeat the process once or twice till the shredded sweet potato finished. 10. Roll the final dough into oblong shape, cut them into equal portion. 11. Place each shaped mantou on the steamer rack with greaseproof paper below it sprinkle the mantou with some water. 13. When done, removed and served hot/warm. b) If the sweet potato dough is too dry, you can add about extra 5 - 10ml of water to knead the dough. c) You might need to cook the sweet potato for about 3 - 5 minutes more before it will be soften depend on the power of your microwave. This is an interesting Mantou with dual sweet potato texture. So if you like sweet potato, do give this a try. I am sure you and your family will loves this healthy snack for a chance during tea-time or breakfast. 10 April 2010, we have being preparing and looking forward to this special day since January 2010. And finally today is the "Big Day" for us. Everyone of us wake up pretty early in the morning and get ready for our last minutes packing/checking before heading to the Airport. 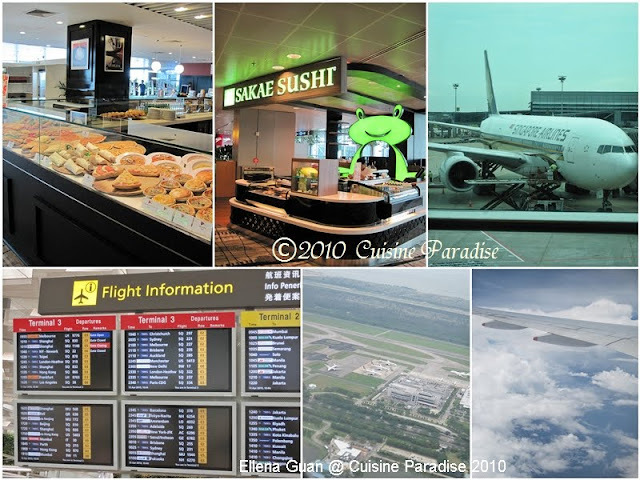 Our flight to Taiwan is leaving at about 12.30pm and accordingly to the tour leader we have to reach Terminal 3 @ Changi Airport around 10.30 for early check-in and briefing. After check-in, we roam around at the duty-free shops and to my surprised I spot "Sakae Sushi" mini counter. Although are able to board the flight around 12pm but the plane did not take off till 1.30pm due to heavy traffic congestion at the run-way. So sad... everyone of us has to wait patiently for the plane to move forward accordingly to the queue number.... we are number 10 on the list. As usual, as a food blogger, I won't missed out any chances to take some photo shots on the food that we eat. And this round I am quiet satisfy with the quality of the food served on board. 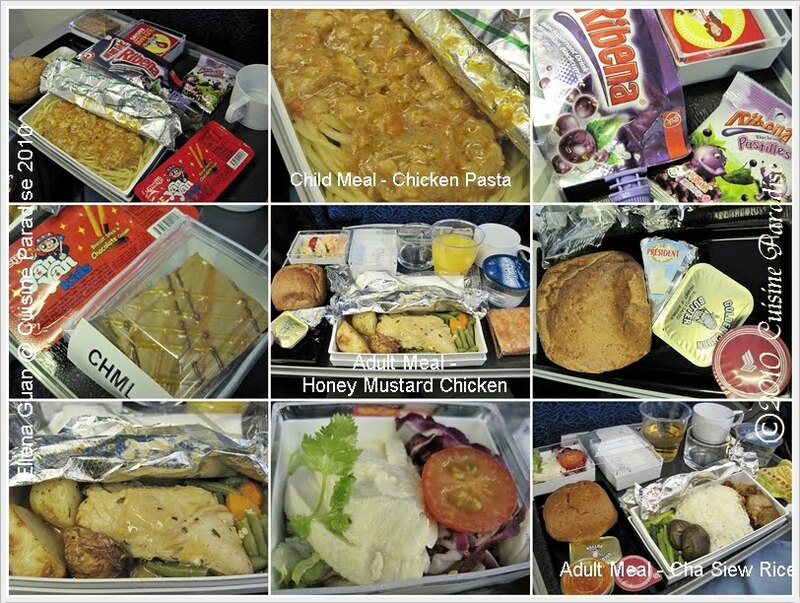 Here are some shots of the food range from Child Meal - Chicken Pasta, and two choices of Adult Meal which is Honey Mustard Chicken and Char Siew Rice. Each meal served with bun, salad, snack and drink of your choice. Rey was very excited with his meal as this is the 1st time he travels with Singapore Airlines. After meal, we sit back to relax on the on board entertainment like movies, games and etc during the 4 hours journey to Taipei. At about 5.20pm we arrived at the Tao Yuan International Airport - Taipei (台湾桃园国际机场) and were greeted by their local tour guide - Jackson whom will be bringing us around during our visit at Taiwan. 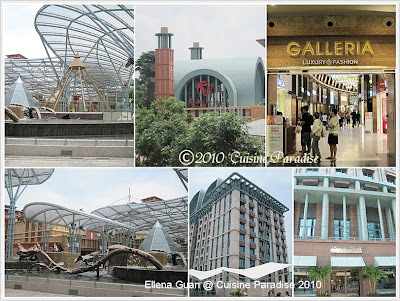 Upon arrival, we are bought to "City Suites - Gateway" for our dinner before going to the hotel. 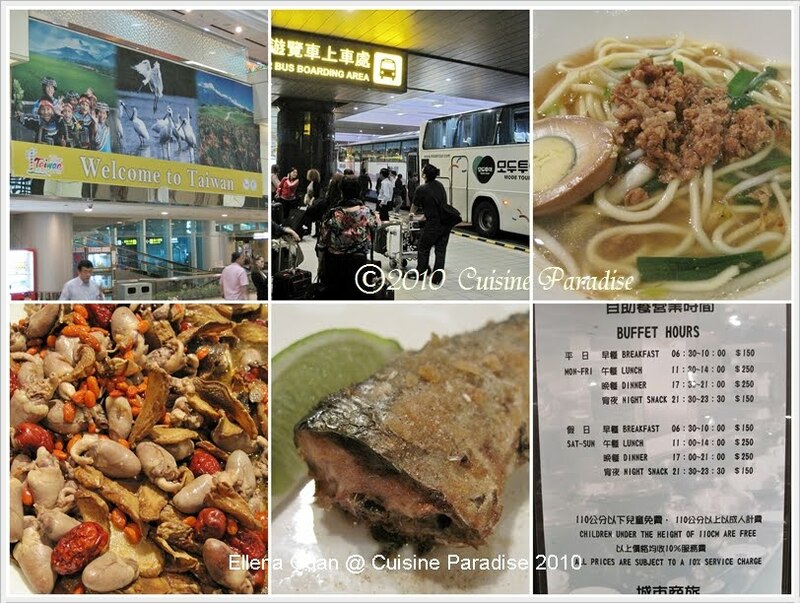 And due to the delay of the flight and tiredness, most of us did not really eat much at the Buffet Dinner. Em... But I have found some interesting dishes which is the "Stir-fry Herbal Chicken Hearts" and "Pan-fry Sardines" that serves with pepper salt.